rating: 4.5/5 [in the genre] or 8/10 [all books I’ve ever read]. recommended for: Fans of Red Rising by Pierce Brown, light science fiction, kickass girls, and Ultraviolet by R.J. Anderson. The Scarlet Letter meets Minority Report in bestselling author Sophie Jordan's chilling new novel about a teenage girl who is ostracized when her genetic test proves she's destined to become a murderer. When Davy Hamilton's tests come back positive for Homicidal Tendency Syndrome (HTS)-aka the kill gene-she loses everything. Her boyfriend ditches her, her parents are scared of her, and she can forget about her bright future at Juilliard. Davy doesn't feel any different, but genes don't lie. One day she will kill someone. Only Sean, a fellow HTS carrier, can relate to her new life. Davy wants to trust him; maybe he's not as dangerous as he seems. Or maybe Davy is just as deadly. 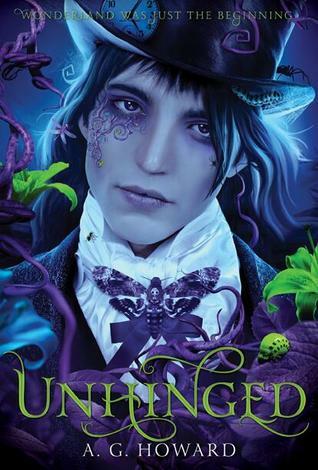 The first in a two-book series, Uninvited tackles intriguing questions about free will, identity, and human nature. 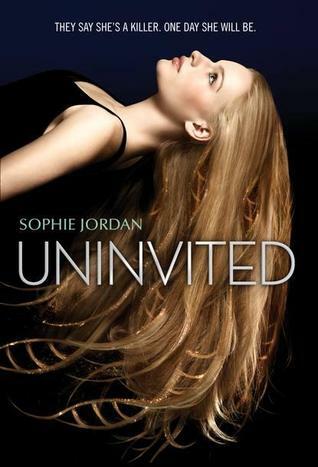 Steeped in New York Times bestselling author Sophie Jordan's trademark mix of gripping action and breathless romance, this suspenseful tale is perfect for fans of James Patterson, Michelle Hodkin, and Lisa McMann. I wasn't sure how Jordan, author of the romantic Firelight (which I liked, though not as much as this early review suggests), would do with a grittier, edgier topic. She proved my doubts wrong. Where Firelight struggled with growing pains, Uninvited shows marks of writerly maturity. The writing is cleaner, the concept better developed. Set in a near-future world where crime is rampant and radicals are ready for any solution, this story capitalizes on the dangers of genetic determinism--and, if you're not into that, of any kind of stereotypes and labeling. It's also a prime example of self-fulfilling prophecies. Formerly popular Davy learns this hard lesson when she tests positive for the Homicide gene. First abandoned by friends who fear her, expelled from school, and rattled by parents who give up on her, she's then roped into a secret quasi-military training camp--the only alternative to internment. The characters were compelling enough to worry me over their futures, the romance sweet and slow-moving. Despite a few rough bits and missed opportunities, this was an exciting, thought-provoking read that amped me up instantly for the sequel. Davy's life is perfect. Until she's diagnosed with the kill gene. Suddenly, her school can no longer house her, her college-of-choice no longer has available slots, and even her best friend and boyfriend are lured by the fearmongering. The friend/boyfriend turning on Davy so quickly was a bit unrealistic. I didn't quite buy it. At least it did show how extensively society has come to fear this condition. So extensively that in her new public school, Davy is teacherless and freedomless, completing self-study assignments in a chain-link cage with other HTS unfortunates. You can't help but feel for her and her classmates. As you meet more carriers, you wonder: were they always like this? Or did poor treatment make them this way? It's a compelling theme expounded upon when the branding is no longer enough and carriers all over the country are forced into prison camps. Only a lucky few, like Davy, are set aside to be trained--but it's a mixed blessing, for chilling reasons I won't spoil. Suffice to say, it reminded me a little of Red Rising. Besides the carrier intrigue, two parts of the plot were most compelling. First was Davy's struggle to integrate this new view of herself. Her future is gone. Her past is ruined. Her relationships are strained. Part of her journey is learning to live in this new world. Then there's the romance. It's instant attraction but not insta-love, and the connection between Davy and Sean is anything but quick and easy. I liked that Jordan opens the book on Davy's near-perfect life. She's a Julliard shoe-in. Her boyfriend is one of he hottest athletes in school. Her future is golden. It makes the contrast even more stark when she learns that she bears a dangerous gene linked to murderous tendencies. It doesn't matter that she seems harmless. Widespread fear of crime ensures that even her friends become wary of her potential. It also puts Davy into the odd position of knowing she has the gene while also believing that others who have the gene are dangerous. That she's "different" from the other characters. This is a belief that wasn't fully dismantled by the end (which disappointed me; she really becomes friends with only the people who seem nice, "mistaken" carrier, rather than finding the good in the seemingly "bad" carriers), but which emphasized how strongly institutionalized fear can override our reason. Jordan's HTS gene is an allegory for racism, classism, other dangerous stereotypes. It's an incisive exploration of what happens when we treat people like animals--how even a tame dog can become a vicious fighter. Jordan could have amped up Davy's self-awareness later on, but overall, it's an engaging premise that, given my research, I feel very close to. But don't believe the comparison to The Scarlet Letter in the blurb. Both books feature ostracized characters. Wow, publisher, great connection... The Minority Report is a much more accurate comparison. Davy was a pretty compelling heroine. Rather than your typical outcast, she's pretty. Popular. Loved. Talented. It's important, because she suddenly becomes everything she fears. Her lack of insight ("I'm different from them") was irritating in that it held on too long, but she also showed surprising adaptability. So much that she surprised herself. The situations in which Davy finds herself bring out new aspects of her character, such that Davy is learning who she is at the same time we are. Then there's Sean--adorable, brooding bad boy. He's not the most unique love interest, but his tightrope walk between protecting others and protecting himself adds a layer to his character. I wish some of the other Cage students and training school students had gotten more page time, because I would have liked to see Davy grow to know them. Gilbert (who can also relate to her new life!) and Sabine were well-drawn, but Coco, Addy, and many others were skimmed over or flat. Zac and Tori, too, seem more like plot devices than friends. Jordan makes up for that with Davy's family; though only present for some of the book, they become deeply human and pitiable in their reactions to Davy's new status. Her brother, especially, delinquent and furious, was a favorite. In the end, I think the main fault here was that the characters Davy befriended were all those who seemed good from the outset (Sean barely counts as a counterexample), whereas a deeper exploration of stereotypes could have been made if Davy were to become close to some of the people who seemed bad or evil at first. It's a missed chance to make a statement. What we do get more of is the opposite: that basically normal people can be pushed to do evil things. Jordan's style here showed a lot of maturity in her writing. Everything was clean and tight, without too much in the way of unnecessary frills. Davy's voice felt real to me, which is one of my top criteria for good style. Moreover, there were some deeply poignant moments, especially around some of the plot twists, that were handled beautifully. Between each chapter is a conversation. A memo. A series of texts. It was a clever way to show some of the world outside Davy's head and also to foreshadow later plot devices. I honestly loved this feature of the book. There were several great instances of dramatic irony that kept me flipping pages because I knew something bad was going to happen and Davy didn't, and I had to know how she would react. Clever, Ms. Jordan. Well played. A chilling near-future thriller about love, identity, and the devastating fear of the different.